Once upon a time there was a software developer writing a small tool to extract strings from binary files. He thought it interesting to see how it travels around the then young web and set it free to the wild. That was back in 1996. To my utter astonishment this little tool is still around out there and creates enough interest to create hits on this site. To honor this and to avoid confusion for visitors coming here for this utility peek (and not some obscure cg related stuff) I created this page for a permanent home of PEEK. Unfortunately I do no longer have the source code, so the binary form must suffice. Once upon a time, there was a software newbie looking for a way to find out what was in those inscrutable windows files. He found in the wild, in a place which has since passed beyond memory, a wonderful utility called Peek. Alas, the author was not to be found for many seasons, but now is revealed. Well met, Martin Lubich. To honor the permanent home of Peek, may the (still and forever) newbie refer seekers to this site? Or is some other arrangement preferred? Now that is a nice continuation of a tale started long ago. So, please tell others of this place and with this and some luck the tale will be told even a bit longer and with this it’s inevitable destiny may be delayed once more. It is my honor to do so. Peek is possibly one of the most used utilities on my computer going as far back as when it was originally developed in 1996, and has helped in too many ways to count, including simply looking inside files before running them, looking for any malware/virus-like code. I’ve recommended to countless people since then, including on my current “Geek / Tech” website. It has always worked perfectly up until installing on Windows 7 x64, and I feel a bit “lost” without it often times. Any tricks on getting it to run in this OS? Glad to hear Peek has been useful for you. Unfortunately I do not have any ideas how to use this utility in a 64 bit Windows environment. Seems like the 32 bit compatibility of 64bit Windows does not include 32 bit shell extensions. Hi, I have just come across the 64bit problem too. Hopefully a 64bit version of peek can be made. I use it all the time on my 32bit machines. 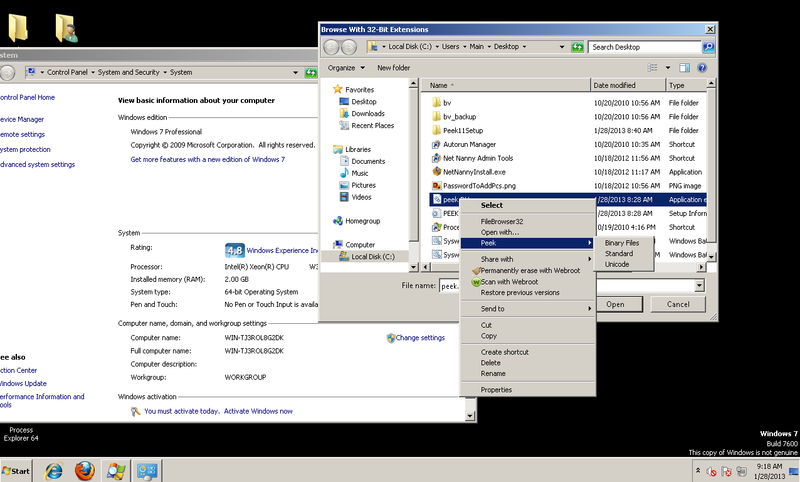 I posted you a response on how to use Peek on Windows 7 64-bit. I’ve been using it for days now — ever since I figured out how to get it to work. A little surprised that you haven’t posted the instructions for others to use. Where exactly did you post this ? Care to provide a link here or post the instruction in full here ? Did it come through this time? I tried to email webmaster and administrator but they both bounced. Yes, now it seems to be online. Sorry for troubles. My Antispam module doesn’t seem to like your comments. Ok, I will try and document this again. I originally submitted the write-up to this comment section just a few days prior to my 2nd comment being posted. Of course, I didn’t document (and save) how to setup Peek and now some others have asked how to do it. So I’ll work through it all again and document the steps that I take. I’ve been using Peek on Windows 7 64-bit for a while now. There is an extra mouse-click in order to get it to work, but it still works none the less. ** Download PEEK from the link above and extract to your Desktop. ** Locate the Peek.INF file. ** Close all your windows. So basically, now you will just have to right click your file first and choose the FileBrowser32 application. A new Explorer type window will appear and and you now use right click files to get the Peek Shell Extension to function. Just an extra mouse click, but worth the extra click in order to use this nifty little program. Thanks a lot for taking the time to document and share your findings. Thought I’d come back and mention that I’ve created a Peek-like app that functionally behaves the same as the original Peek shell extension, and it works in both 32 Bit and 64 Bit Windows. VERY simple to use and no weird registry hacking or work-arounds needed. Would love to hear feedback and/or suggestions!